Data Grid Controls in PHP Or Best Three PHP Data Grid Libraries. 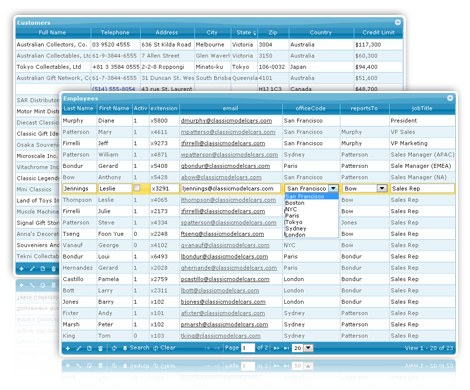 PHP Grid with little config, enables Add, Edit, Del, Auto-filter, Search, Sort, Page, Grouping, Export, Custom Add/Del Calls, Master-detail Grids, Multiple Databases, Customizable Themes and many other features. It’s Secure & Commercially Opensource so you can extend your own core functions. Best suitable for smart engineers, who wish to save development time & effort of creating repetitive CRUD functions through out their projects. 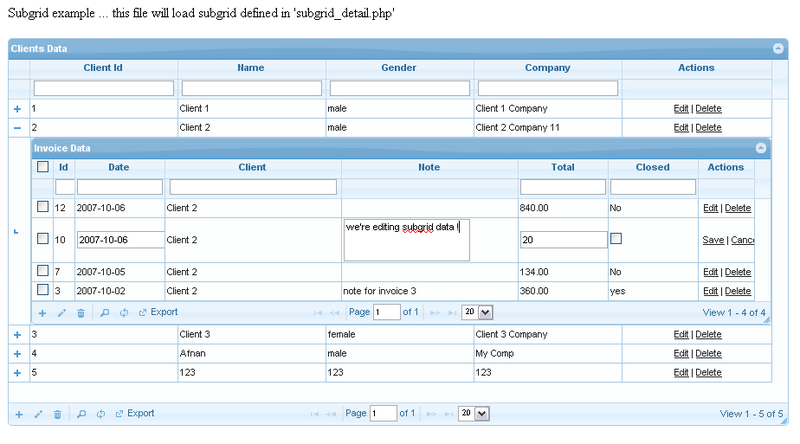 Custom SELECT query option is useful for cross table data displaying and Reporting generation. PHP Datagrid Controlis extendable and you can write your own Custom Code-behinds for adding, updating or deleting records. Supports all major databases including Mysql, SQL Server, Oracle, PGSql & ODBC Driver supported databases. Data Grid Libraries provides professional-looking Ajax-enabled grid-based editing, create, read, update, and delete (CRUD) operations for Web developers in as little as two lines of code. It features cross-browser inline editing, support for all HTML form controls, integrated search toolbar, a master detail datagrid, image display, MS , HTML and PDF data export, permission control, a theme roller, built-in record sorting by any column, support for major databases including MySQL, SQL Server, and Oracle, support for large database record sets, and some times WYSIWYG and Ajax file upload. Create a fully functional datagrid in PHP for as little as five TWO lines of code. The phpGrid is a simple, powerful and fully customizable PHP grid control for generating data-bound, AJAX editable datagrid…now with WYSIWYGand file upload support! . phpGrid is a simple, powerful and fully customizable PHP control for generating data-bound AJAX PHP datagrid… now with WYSIWYG and Ajax file upload support! phpGrid allow you to create a fully functional datagrid in PHP for as little as two lines of code. KoolPHP is a vendor of PHP User Interface (UI) components. We focus on building the featured rich yet easy-to-use components to help developers increase productivity and deliver highest quality applications within time and budget constraints. Koolphp is my 2nd best dataGrid that contains a group of great UI controls to help developer build excellent web2.0 application. Working with Zend, CakePHP, Joomla, Smarty. jqGrid is a grid component for ASP.NET & PHP based on the world’s most popular and flexible jQuery grid plugin. jqGrid is free, open source and gets distributed under the MIT license. This entry was posted in PHP (Hyper Text Preprocessor) and tagged about grid controls, Ajax, grid controls tutorial, Grid view, HTML, Joomla, JQuery, learn php grid controls, MySQL, PHP, php grid controls, php grid controls tutorial, SQL. Greetings From The Web Pixel !!!!!!!!! We having Good opportunity for fresher’s B-tech( IT/CS)/BCA/MCA open profile is Business Analyst (Post Sale).Applicant should be good communication skill(written and verbally) and more about knowledge in information technology. The Web Pixel Pvt. Ltd. is one of the most familiar complete web solutions company in India. We are in business since 2008 & committed to the long-term satisfaction and business success to each of our customers. Note: If you have references for this profile like they have good communication skill and strong technical knowledge then you can share with us. The Web Pixel Pvt. Ltd. This entry was posted in Information Technology Jobs and tagged Business analyst, business analyst job in jaipur, core php jobs in jaipur, freshers jobs in jaipur, frshers jobs, PHP, web development jobs, web pixel pvt. ltd jaipur, web pixel pvt. ltd jaipur jobs. With the recent reforms taking place in Myanmar, it looks set to be opening its doors to plentiful opportunities from the international community. Of particular interest is the revision of its Foreign Investment Laws which will facilitate foreign investors injecting capital into the country. The Myanmar Logistics & Supply Chain Conference 2013 is the only strategic logistics and supply chain conference where people, innovation technologies and best practices converge to define the realm of SCM in Myanmar. It aims to provide the international platform where global supply chain practitioners network and learn about the opportunities presented with the opening up of various sectors in Myanmar. This entry was posted in New Technology News and tagged Business, Business and Economy, Management, Myanmar, SAP AG, SCM, Supply chain, Supply chain management. Urgent Requirement for PHP Developers in A3logics jaipur. A3Logics (I) LTD. is a global consulting and technology services company offering industry-specific solutions and integration services through a unique onsite, offsite, offshore delivery model that helps our clients achieve reduced ‘time to market’ their products and world-class quality on-time in budget..
Having experience in delivering solutions for clients operating on SaaS [Software as a Service], We”ve worked on various domains such as Java, ASP, JSP, Servlets, Struts, EJB, JDO, Swing, Applets, JMF, JMC, Web logic, automated testing, load and performance testing, test case creation and execution. Moreover, we handle Oracle, MS SQL, DB2, MySQL and Access. In the last few years we”ve worked for Software Quality Assurance, Web based application Development, Shipping and Logistics supply chain solutions, E-commerce, CRM and EDI domains etc. Our team works along with the onshore teams to provide all assistance for efficient execution of projects. Act as extension to the client”s development and post development support requirements. The company has ‘Strategic IT outsourcing’ alliances with some of the world”s biggest Ocean Carriers and fleet owners. Our Logistics Solution provider clients own more than 72% of the global shipping containers and most of the transportation ships. Experience in PHP application, CMS based application, Shopping Cart Application. Candidate should be able to join us asap, maximum in 20-25 days. Neha Mathur |HR Executive | A3LOGICS (India) Ltd. This entry was posted in New Technology News, Uncategorized and tagged a3logic jaipur, a3logics job in php, a3logics jobs, core php jobs in india, core php jobs in jaipur, experienced php developers, fresher php developer jobs, freshers jobs in jaipur, Jaipur, PHP application, PHP Developers, Software Quality Assurance, urgent requirement. WALK IN INTERVIEW FOR FRESHERS AND EXPERIENCE DEVELOPER. Please contact to Mr Rakesh Sir (8401755192) for interview time schedule. This entry was posted in Information Technology Jobs and tagged Ahmedabad, developers job in ahamdabad, it field jobs in ahamdabad, jobs in ahamdabad. 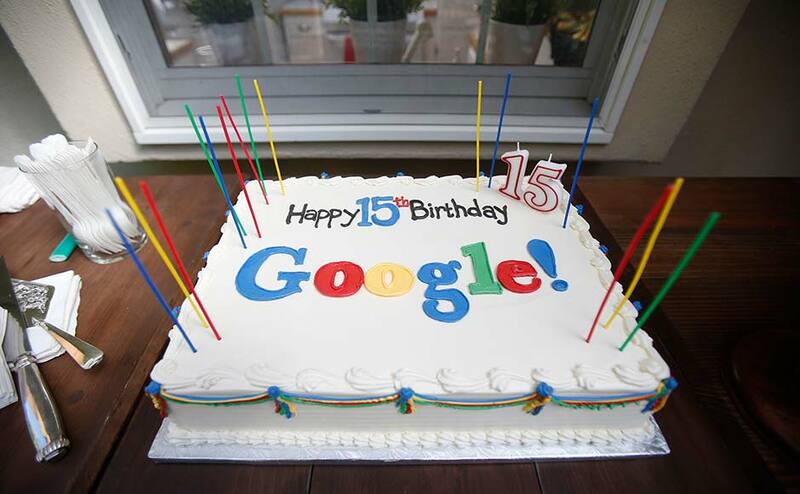 Bangalore: The search engine which was taking us on sail across galactic internet has turned 15 today. Happy Birthday Google! Larry Page and Sergey Brin, the Ph.D. students at Stanford University, filed papers to incorporate their dream, a search engine company, on September 4, 1998. However it got only incorporated three days later and the domain name “Google” was registered on September 15. For some reasons Google officially celebrates the event with a Google Doodle on September 27. The young founders wanted to nickname their new search engine “BackRub”, as the system checked backlinks to estimate the importance of a site. Eventually, they changed the name to Google, because an investor has signed the check with misspelling of the word “googol”, which meant 10100, and Page and Brin just accepted it that way. Though started with the misspelling, Google is now world’s number one search engine. Its name has become so synonymous with search that it is now used as a verb in its own right. This entry was posted in New Technology News and tagged 15 birthday celebration celebration, google, Google Doodle, History of Google, Larry Page, Page, Sergey Brin, Stanford University, Web search engine.